Designed by Greg Norman, El Desafío (The Challenge) opened its first nine holes for play in 2015 as part of a private resort featuring golf and polo, as well as other equestrian sports, a nature reserve with trails, private residences and golf. Lauded by many as the future No.1 golf course in Argentina when all eighteen holes open, the layout at El Desafío is set high up on a mountain with the front nine playing alongside and across deep canyons and pine forests. The back nine is set higher up on a natural plateau across more rolling terrain. As Norman described, “the views are absolutely stunning in all directions and the topography allowed for routing the course amongst some of the most scenic golf terrain in the world”. No two holes play in the same direction, and Norman does a neat job framing stunning vistas on every hole. El Desafio has wide generous fairways allowing for multiple strategies off the five sets of tees. Fescue fairways and green surrounds play fast and firm, ideal for the ground game using the natural terrain. Beautifully designed rugged bunkers are strategically placed and add great contrast to the course, but most greens use also wide open slopes and ridges for protection, making the course very interesting. Greens run true and slopes are not too aggressive. Every hole on the front nine is unique, and spectacularly designed, but the developers tell us than the back nine will be even better. We have to agree with Tom Doak when he says El Desafio will probably be the best in Argentina when finished. Doak went as far as awarding El Desafio the highest rating of any course in South America together with Potrerillo de Larreta. Doak also lists El Desafio at the top of the most unique courses and best cart courses in Volume II of the Confidential Guide to Golf Courses. A must visit course right across the street from the great Chapelco Golf. Third time here and the course still grows a little bit each time. My first one was Dec 31st 2014, second Feb 2017 and now twice 2 weeks ago. And in 2 different days, one with 23 friends playing a very fun team competition in tough windy conditions and the other one on my own on a 28c sunny morning, both different and very enjoyable. What I believe valuable to add from my previous reviews is how in good condition the course is, especially tees which are literally carpets. Greens on the windy day were an extreme challenge with some crazy pin positions the Management Team prepared for us to make it more enjoyable and certainly it was. I said it before and will repeat it again, once this course completes 18 there will be a course tough to beat as South America's #1. Work is in progress, it might take a couple of years but already San Martin de los Andes with this one and Chapelco who hosted PGA Tour LA event one month ago the destination is well worth the visit. And just one piece of advice: use the back tees no matter if your golf skills are noth the highest, the dramatic views they offer are second to none here in Argentina. Score will not be important, the pictures you can take are all it matters. It’s just after noon. I have just arrived from the jaw dropping splendour of seven lakes road from Bariloche, at the five star Loi suites in Chapelco, St Martin De los Andes, and before I know what is happening I’m in the back of an anonymous Toyota sedan. Two burly Argentines, swarthy and muscular are in the front seats. Quick fire chatter passes between them as we are waved passed a security check point onto the main highway. Shortly after, we dive off the tarmac, lurching onto a dirt road. We are waved through another checkpoint, they know the plan but I’m none the wiser. I just glimpse the barrier lowering through the dust cloud behind us on this stony road. Up, up and Up. Where are they taking me? Ten minutes of twisting track and slithering road and we grind to a halt outside two shipping containers set back from the road, hidden in the woods. This is it. I’m only 43. What about the children? The doors open and I’m blinded by the sunlight streaming in. I hear the metallic clunking of my fate. Fortunately, It’s my clubs being loaded onto a golf cart. You can’t walk El Desafio, the nine world class holes are laid out on the side of a mountain. Strictly carts. Well, I’d like to hand out some awards. Let’s call them the Jimsters. The first Jimster goes to the best nine hole course in the World, The second Jimster goes to El Desafio for being the most improbable and surreal Golfing experience of my young life. 1200 meters up in the Andes, miles from anywhere, this young course has been executed to the highest standards. It’s Babylon. It is a new born Golfing Machu Picchu. You just stand there. Jaw open in wonder. The guy who built this is the best kind of lunatic. The genius in a room of fools. Is it folly? Time will tell. Built to lure second home owners to buy plots, it is not a green fee reaper. Therefore, on the two occasions I played it, I was virtually alone. Trillionaires golf. The fairways are necessarily generous. The thin wind at this altitude is always a factor. The pictures say it best but the nine holes there are here, currently represent the very best of what can be done in modern architecture and I think it is pretty rare and as good as anywhere. Anywhere. 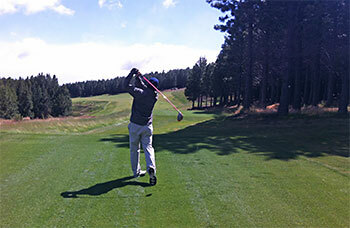 Add to that the epic visitors of Andean volcanoes on the horizon and the immediate pleasure of launching drives over grisly ravines and then threading shots down avenues of pine from carpet like fairways to simply exquisite greens is nothing short of intoxicating. Whilst it is only nine holes, I would say its best to play it like a wasp. Black tees and yellow tees and then vice versa. Every hole is magnificent. Stunning. This is heavens doorstep. Unique and other worldly. If you make time. If you make the journey. You will find a reward without parallel in this incredible landscape. Peerless. Don’t tell everyone but Argentina has it all. From my fireside Sofa here in darkest Surrey, I can’t recommend it highly enough. The cities, The people, the culture, the tradition, the golf. It’s a world in one country. And what value. It’s closer than you think. Just make sure you speak to Javier of Wegolfargentina. His team will look after your every need. 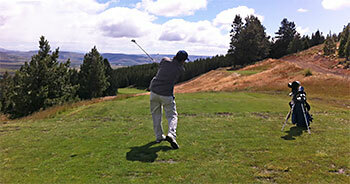 Argentina is off of the beaten track for golf holidays. But it really shouldn’t be. That’s up to you now. Sincerely. Huge thanks to Mariano and Hernand for showing me around. Mr JCB LAY, than you for such a wonderful review of our course. We hope to see you back soon, no shipping containers, and all 18 done. Very best. I played this course in late February for the second time in my life, first one (see previous review) was end of 2014 so it was 26 months after the first time. Although it was some months ago, my memory will help to give a quite precise of how the course has "grown" since December 2014. The first fact is that now all front 9 are finished and 100% playable. 2 and 3 are two in and out nice par 4s and 9th is a great par 3 with a big rock after the green and the highest spot in the front 9. The course is still to be finished in many aspects: construction for the back 9 is supposed to start this month, still no Club House and just a few carts which are necessary because for 95% of the golfers the course is imposible to walk as it has some sharp up and down walks and in other cases long distance from green to next tee, espcially from 5th green to 6th tee. I really expect this course to be finished, it will be good for them, for Chapelco, for the destination and even for golf in Argentina for foreign visitors. It will for sure be one of our most famous courses, not only a great design and challenge but an awesome piece of land elevated even from Chapelco Golf. We played in a very quiet sunny morning, 25C, almost no wind, some low clouds which made it an even nicer landscape and course was in perfect shape. It is extremely enjoyable and playable, there are some "forced" carries but not longer than 120yds so everyone can make it. It may make some golfers to be afraid, but it is just beautiful. And fun. The three new holes are excellent: 2nd has that forced carry with the tee shot with a fairway rolling left to right but the fairway is much wider than it shows from the tee box so just go left and you will find no trouble. Approach shot is a little bit uphill but not long and difficult at all. Then 3rd is a little bit longed and back uphill in the approach with the terrain holding the ball on the right but if you miss left there is trouble. 9th is very nice, with the rock and mountain on the back of the view and shows to be shorter (I over clubbed and flew the green), but there is where to miss and not to be in big trouble. Now you have a great 9 holes course, must play even more than once. And we just keep fingers crossed to have all 18 soon, it will be famous! It is not an easy task to describe a course which is just half way finished, but these 9 holes deserve some words to give you a preview of what in my opinion might be the best course in the continent and a top 50 course in the world. The piece of land is just amazing, in between the mountains with huge and dense pine tree forests, showing downhill views of Chapelco Golf and breathtaking views of the snowed mountains. A perfect layout which takes advantage of every feature of the piece of land. The Management and Design Team: I have to be honest and Greg Norman is my youth hero together with Jack Nicklaus, but I feel what he is creating here is one of his best designs and will be a reference in Argentina. The Economic Scenario in the country made it take longer to finish the Course, with once it is finished it will be a must for every golfer visiting the country. As the course is way high climate and specially wind will be factors (as in the UK) but will not stop golfers from playing in a unique piece of land. The destination, combining this one with Chapelco Golf and fly fishing plus great gastronomic options, will be a place to be experienced. I was invited to play the Course on December 31st 2014, it was windy and very cold (5°C) but sunny and a great experience. Holes 2-3 were not playable so I played 1-4-5-6-7-8-7-8 (all pars, I keep as a memory the ball used) and I was very surprised. I heard the course was good, but didn't expect it was that good! Hole 1 has an amazing tee shot with a dramatic 200 yard carry, hole 4 is a great par 4 with a downhill fairway and very wide fairway. 5th hole is an accesible par 5, with a very nice second shot. 6th is a downhill par 3, with a very generous landing area and green complex. Number 7 was my favourite, a short reachable par 4 where the braver you play the highest the benefit and if you decide to play safe the approach is not easy at all to a very challenging green. Number 8th is a great uphill par 5, not reachable unless a strong downwind. And 9 is a supreme par 3, with a big rock by the green acting as a centinel. There is nothing bad I can say today of the course. I have a big hope on it once they finish it and hope to keep my game in order to enjoy a couple of competitive rounds in the future. If you travel to Argentina, this place is a must visit together with a barbecued lamb there after play. Thank you for the awesome review and we are sorry you had particularly bad weather. The full 9 holes are now open for play and holes 2 and 3 that you did not play are probably the most dramatic and most difficult, respectively. We hope you can come back soon.